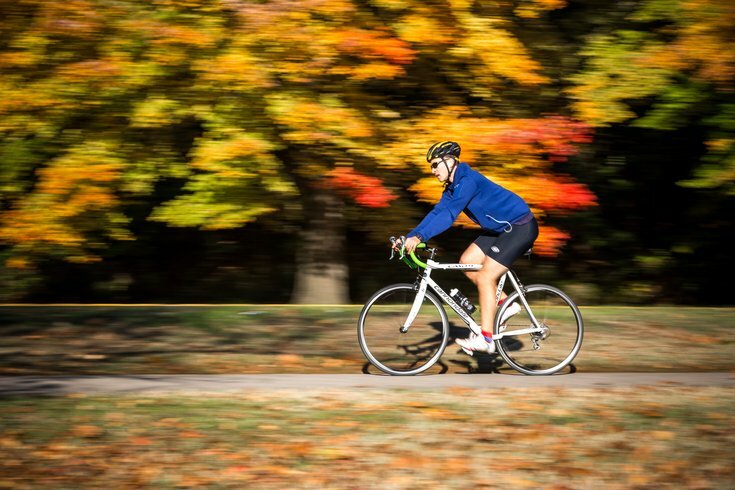 A cyclist rides along the Schuylkill River Trail on a warm autumn day in Philadelphia. Fall is almost here, and with it begins the blitz of seasonal and holiday treats. Pretty soon, it’ll be spring again, and you’ll be worried about how to get your summer body back. Sound familiar? Almost every source you read on fitness and health will stress nutrition, and there’s a reason for that. A well-balanced diet provides energy for your body and can also help with healing. If you’re eating foods that are mostly made up of empty calories – like baked goods, sodas, and cheese – your body isn’t getting the nutrients it needs to stay healthy. You don’t have to completely cut these foods out, but replacing some of empty calorie foods with nutrient packed ones – like salmon, kale, blueberries, and even dark chocolate – will help your body stay at peak performance. Another critical part of maintaining a healthy body is being aware of your water intake. Our bodies require water to stay hydrated – particularly during and after exercise. Drinking water also causes the body to produce more urine (which helps to flush out bacteria) and helps prevent kidney stones and urinary tract infections. Water intake can also suppress your appetite because the brain uses the same signal for hunger as it does thirst. So, if you need a little help skipping dessert after dinner, replace that slice of cake with another glass of water. Exercise should be a part of your regular routine, not just your desperate get-ready-for-summer regimen. By making exercise a part of your daily life, you’ll have an easier time staying fit than you will if you binge exercise. In fact, consistent activity helps moderate your metabolism. Consistent exercise will also help you to avoid injuries and overeating, both harmful possibilities that come with binge exercising. Aside from helping you keep that summer body all year long, regular exercise also has the added benefits of lowering your risk for cardiovascular disease, diabetes, and cancer. It also improves your mood and ability to handle stress, and it increases your chances for a long, healthy life. A good way to think about cultivating a regular exercise routine is to shoot for at least 30 minutes per day, 5 days per week. Once it becomes too cold outside to go for a daily swim or hike, try winter activities like skiing, snowshoeing or a high-intensity walk around the neighborhood. Setting realistic goals that hone in on what you can do, rather than on your measurements, is a great way to keep up your long-term commitment to fitness. For example, having a yearly running goal (say 70 miles in a year) seems more doable than promising that you’ll lose five pounds each month. Work your way up to goals that focus on your getting stronger. Joining workout groups is another way to keep yourself honest and focused on your fitness goals. Here in Philadelphia, there are numerous exercise groups, many of them free, such as City Fit Girls, Yoga on the Pier, and Community Bikes and Boards, who sponsor community events and group rides. If you’re a runner, Run 215 is an excellent resource for guiding you into the awesome Philadelphia running community. Looking for some weekly workout classes? Check out one the many weekly fitness classes offered at Independence LIVE.